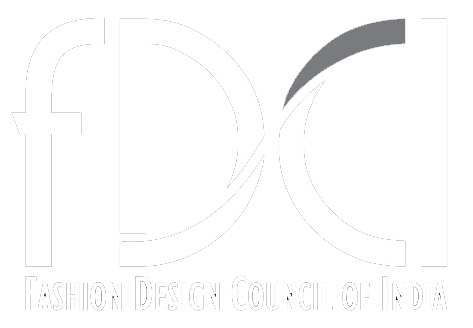 Forty designers, one mission —- celebrate liberty, freedom and human rights as SC decriminalises Article 377, a win that saw reverberations on the LMIFW spring-summer’ 19 runway. Most things that we value in life are free and one of them is love; it is that deep passion that only the intensity can be felt, not measured. When the Supreme Court repealed Article 377, it was a joyous occasion for activists and this victory found its way on the runway at the LMIFW SS’19 on an almost wintry evening. As the cold air set in, the insides of Jawaharlal Nehru Stadium were vibrant with chants and slogans of ‘Love is love’; ‘More love less hate’; ‘Love wins’; ‘Same love same gender’. It also got a literal representation when Suneet Varma and his longtime partner Rahul Arora shared a kiss on the catwalk making sure that legally this was no longer a crime. Forty designers interpreted the rainbow theme, a mascot for the LGBTQ community worldwide to represent civil liberty and freedom of thought, above all to celebrate, who they are and give wings to their long and hard fought acceptance. Interestingly, never has the hall seen so much live energy and never has an audience given a loud applause even before the show began. 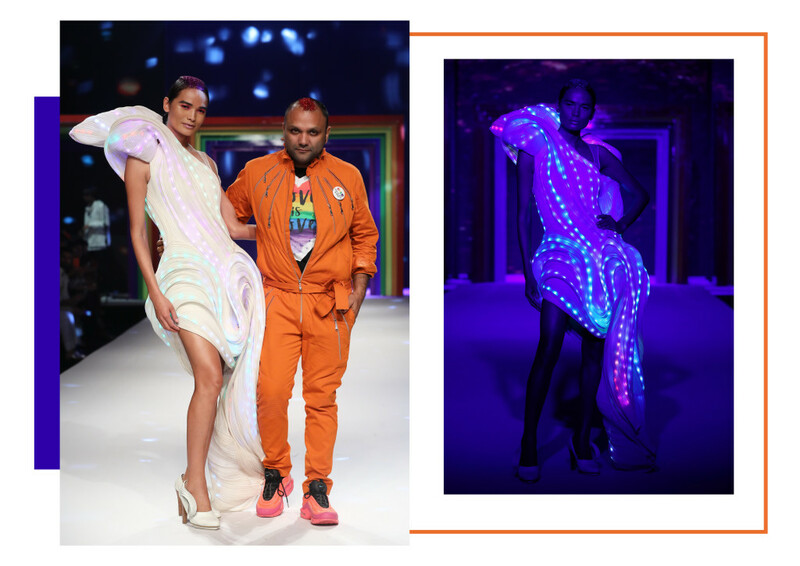 The king of gowns Gaurav Gupta opened the show with Anjali Lama, the first transgender model of the country, in his famous LED light dress that lit up the pristine white ramp. The musicians crooned Gloria Gaynor’s 1978 classic ‘I will survive’ and George Michael’s ‘Freedom’ as Abraham and Thakore dressed men in dhoti saris and the original menswear rockstar Arjun Khanna got his model in a Scottish kilt, while Gautam Rakha added colours of liberty to his fringed sari. Though it was the almost six foot tall wonder Sonalika Sahay who’s back had an important message emblazoned with a glittering heart that was beating with the words on everyone’s mouths— Love is all, while choreographer Aparna Bahl distributed badges that conveyed similar messages. 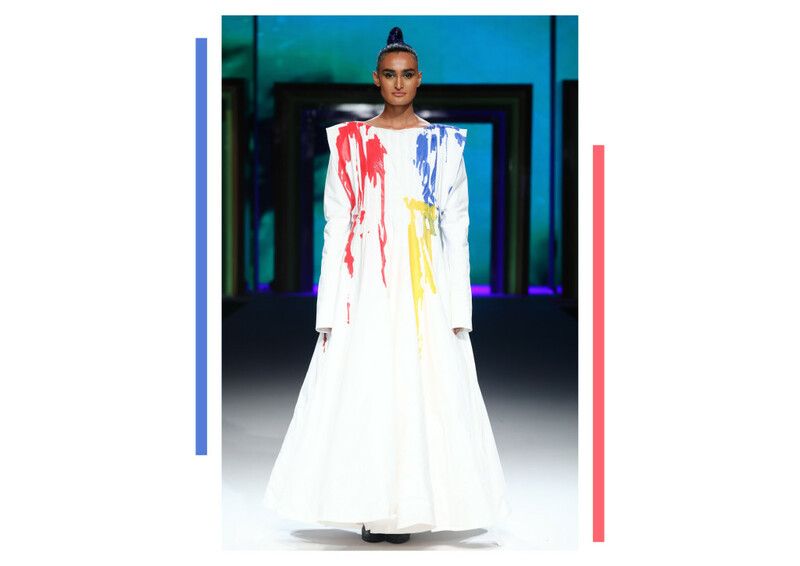 The always ingenious Rajesh Pratap Singh’s rendition of colour was fresh paint splattered on a white dress that he let drip, to form its own unpredictable patterns. It was one voice for a message that was filtered through the medium of ensembles and the fashion fraternity stood together to herald a historic verdict that will change the way we look at marked gender distinctions forever.